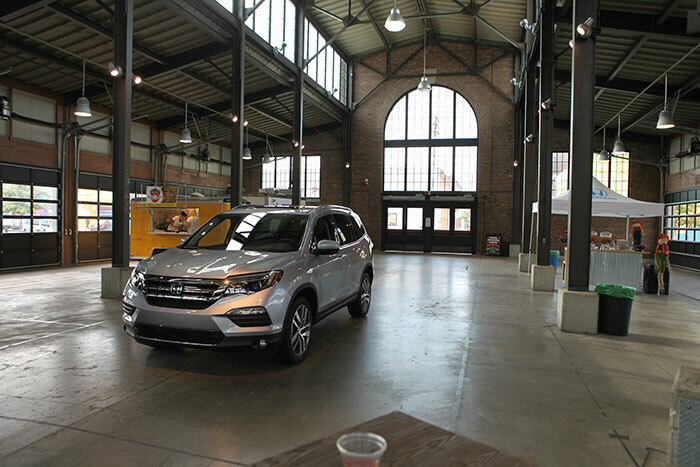 Yesterday afternoon at Detroit's Eastern Market, Honda revealed the all-new 2017 CR-V to a collection of journalists. Despite numerous rumors to the contrary, the CR-V hasn't grown as much as many had suggested, nor does it feature a 3rd row (and for the record, we always thought that one seemed to be off the mark). It is now 1.2" longer, 1.4" wider, and features a 104.7" wheelbase, representing an increase of 1.6" over the outgoing 4th generation CR-V. Despite the dimensional increases, weight has actually decreased by roughly 50-112lbs, depending upon trim level. Pretty much every trim level gets a +1 upgrade in wheel/tire size, so the body structure is clearly much lighter than the outgoing 4th generation CR-V. In addition, we expect it to be stiffer, safer, and quieter as well. With an uprated version of the turbocharged 1.5L L15B engine from the 10th-gen Civic, EX and above CR-Vs will feature 190hp and 179lb-ft of torque, delivered through a CVT transmission. LX versions of the CR-V will have what seems to be a carryover 2.4L engine, with 184hp and 180lb-ft of torque, also connected to a CVT transmission. If you look at the photos of the engine (particularly the rendering in the PR photo set shown in the official press release), you'll see an interesting resonator sitting on top of the valve cover. We're told that this is to tune the intake sound. We've seen plenty of resonators on the intake tract before but this one looks almost like a secondary airbox. Speaking of airflow, the 2017 CR-V is the first Honda to feature an Automatic Shutter Grille system to improve aerodynamics. 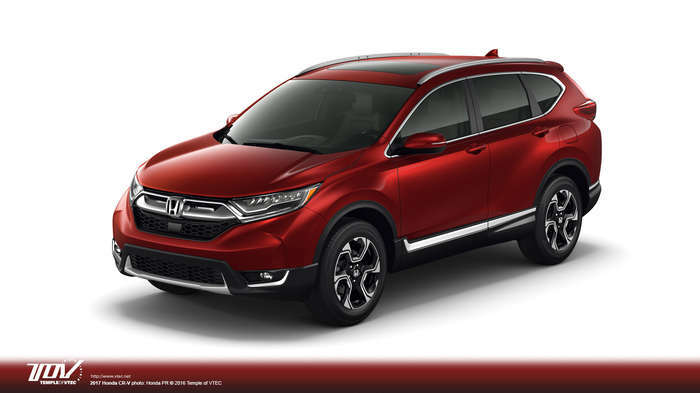 Honda has pushed the CR-V upscale via its feature set and has made an effort to give it more premium styling as well. Top (Touring) trim levels feature LED headlights and taillights, and all trim levels feature LED daytime running lights. A power tailgate with hands free access is standard on the Touring trim. Honda Sensing is now standard on EX and higher trim levels. The 2nd row seats fold flat in a single motion. The rear seat cushions no longer flip need to flip forward, they merely shift forward slightly to accommodate the tumbling seatback. As we have been hearing, the audio system sees the return of a physical volume knob. Expect to see it returning to most future Hondas, for that matter. The cargo floor features two positions, with the lowest level providing the maximum possible cargo area, and the upper position providing a perfectly flat cargo floor when the seats are folded. It appears that the AWD system remains the venerable Realtime AWD system, but interestingly there is a mode on the LCD instrument panel which shows AWD torque distribution (see photo gallery). It appears that Honda has a winner with the new CR-V, as we expect pricing to continue to represent one of the best values in the class. As for an on-sale date, we were told "December".